After Breakfast short boat trip to Ujung kulon Peninsula (CIBOM) trekking to CIRAMEA, walk through the dense forest from Cibom to Ciramea beach (this sandy coast line is the egg-laying site for green turtles particularly between june to September), along the way javan black monkey, hornbill taucan and black giant squirrel are often be seen. Duration approximately 1,5 hours, arrive at Ciramea beach take a rest , and then continue trekking along the coastal to Tanjung Layar a historical site where two previous lighthouses and staff quarters were constructed in the 1800’s . 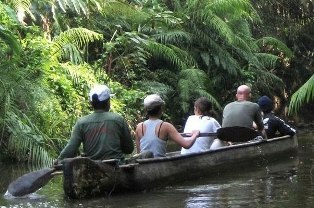 Then, short trekking to CIBOM, where our boat is mooring and crossing to Peucang for lunch. In the afternoon at 16:00 take boat to Ujung Kulon Peninsula (CIDAON), observe wild life at CIDAON grassing ground such as wild cattle, peafowl, javan wild pig, birds, etc , leave Cidaon to the beach waiting for sunset while having tea/coffee and pisang goreng. Return to PEUCANG island . Dinner and overnight at park lodge.